Posted on Tue, Feb 28, 2012 : 2:04 p.m. If one bracket projection is correct, the Michigan basketball team could face an interesting NCAA tournament path. Jerry Palm's latest CollegeRPI.com bracket projection slots Michigan as a No. 3 seed facing off with No. 14 Drexel in Nashville, Tenn. Joining Michigan in the same Nashville pod? Ex-Michigan coach Steve Fisher and current Wolverine coach John Beilein's former team, West Virginia. 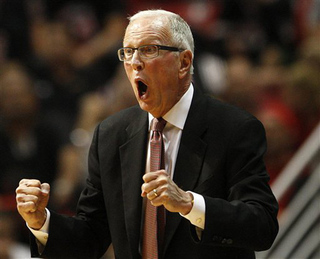 Would you want to see former Michigan coach Steve Fisher face his old team in the NCAA tournament? Palm slots Fisher's No. 21 San Diego State squad as a No. 6 seed facing West Virginia during a second round matchup. Meaning the winner of the Aztecs-Mountaineers game would face the winner of Michigan-Drexel in the round of 32. So, if Palm's projection were to hold, there would be no shortage of potential storylines awaiting Michigan in Nashville. Hired as an interim coach prior to the 1989 NCAA tournament, Fisher led the Wolverines to their first — and only — NCAA crown several weeks later, knocking off P.J. Carlesimo's Seton Hall squad in the final. Three seasons later, Fisher brought Michigan's famed "Fab Five" recruiting class to campus, resulting in back-to-back Final Four runs. His Michigan legacy has been since marred by NCAA and school-imposed sanctions, as Fisher's role in the Ed Martin scandal led to his firing in 1997. The school has since vacated both Final Four appearances, and all victories from the 1992-93, 1995-96, 1996-97 seasons have been forfeited. West Virginia, meanwhile, sits firmly on the bubble at 17-12 on the season. Current Mountaineer boss Bob Huggins replaced Beilein in 2007, eventually leading WVU to the 2010 Final Four with a roster that included several Beilein recruits. Fisher took the fall . . . Wed, Feb 29, 2012 : 3:09 a.m.
Maybe better said he was the skapegoat, but yeah. Wed, Feb 29, 2012 : 12:25 a.m.
You are correct. Cleeves took just as much money per grand jury and Izzo skated. HA! In what way did Fisher take the fall? He never owned up to ANYTHING, do you think he didn't know what was going on? Wouldn't a coach think it odd to see a player driving around in a brand new car? Or constantly having new clothes? Fisher never took any fall. Tue, Feb 28, 2012 : 7:13 p.m.
Fisher is irrelevant to Michigan at this point though obviously historically he is the coach who won a championship and got the Fab Five, and was the steward over a bunch of guys who got our program put on probation. I don't wish Fisher badly--I'm happy for his success but I don't think that is an association at this point. As far as WVU--all of B-line's players are gone as well as the athletic administration, so again, I think it is no big deal. (Unlike if our football team were to face you know who).